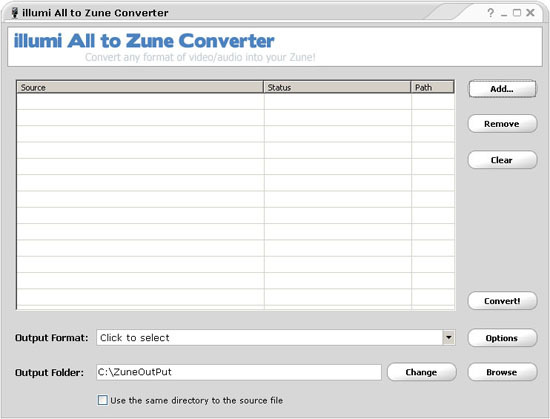 illumi All to Zune Converter - Convert any format of video/audio into your Zune! Just download illumi All to Zune Converter, it will help you done all the conversion work needed. With illumi All to Zune Converter you don't have to learn professional knowledges, just with a few click, you're done! Here are some video format it supported: AVI, DivX, Xvid, MPEG, 3GP, SWF, FLV, etc. Supported audio: MP3, WMA, AAC, MP4, MOV, WMV etc. Convert any format of video/audio into your Zune! * Here are some video format it supported: AVI, DivX, Xvid, MPEG, 3GP, SWF, FLV, etc. * Supported audio: MP3, WMA, AAC, MP4, MOV, WMV etc. * 800x600 or higher Resolution, 16 bit or higher Graphic card. convert DVD to Zune video MP4, MPEG-4, WMV files. Convert popular video files to Zune video format files. Qweas is providing links to illumi All to Zune Converter 2.0.1 as a courtesy, and makes no representations regarding illumi All to Zune Converter or any other applications or any information related thereto. Any questions, complaints or claims regarding this application illumi All to Zune Converter 2.0.1 must be directed to the appropriate software vendor. You may click the publisher link of illumi All to Zune Converter on the top of this page to get more details about the vendor.